It’s a “when in Rome” kind of thing, really. And I’m happy to do it. 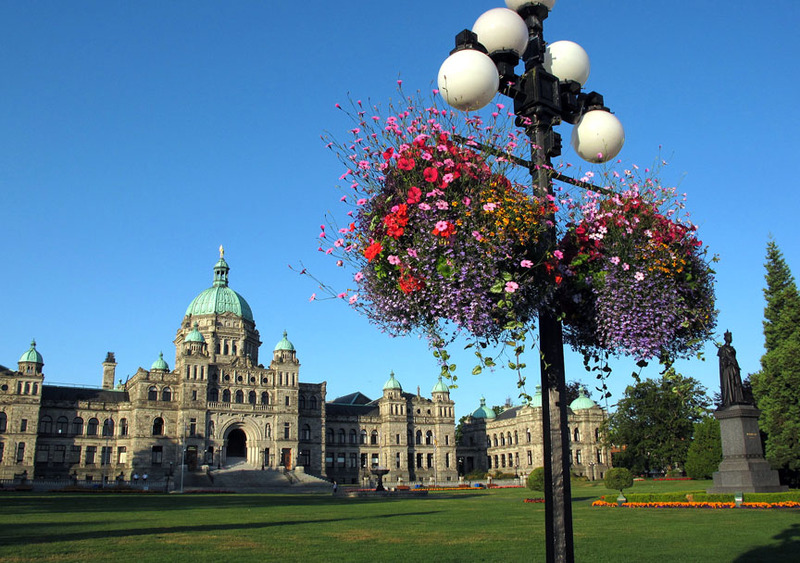 Because once I get to Victoria, there are some “must-do’s” on my list, especially around the Inner Harbour. 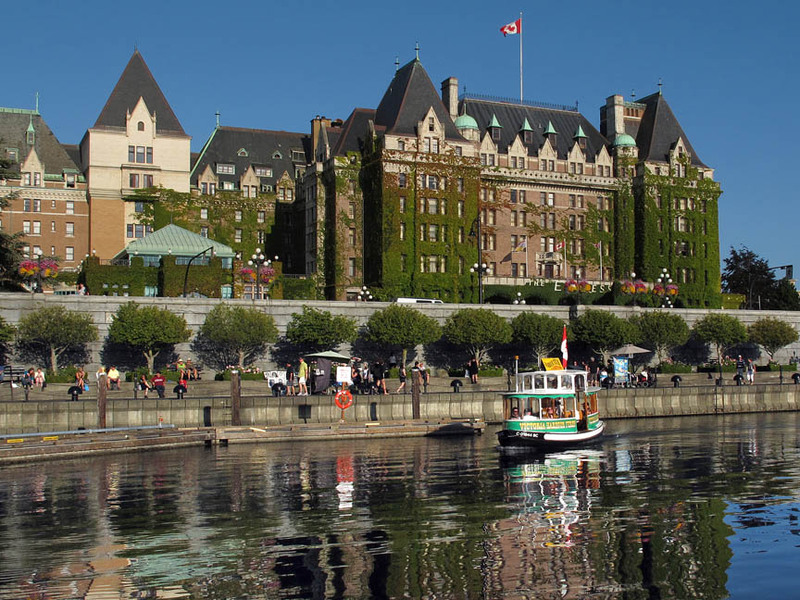 The Empress Hotel on the Inner Harbour, Victoria, B.C. I must admire the grandeur of The Empress Hotel, the grande dame and centerpiece facing the harbour. I also love the little water taxis, the Victoria Harbour ferries, that zip around like busy bees, dodging bigger boats and ferries, as well as the float planes taking off and landing. How they coordinate so well amazes locals and visitors alike. You can take a water taxi up into the Gorge and get a water-level view and a good bit of local history from the very knowledgeable captains. The water taxis of the Inner Harbour—a cute little ride. 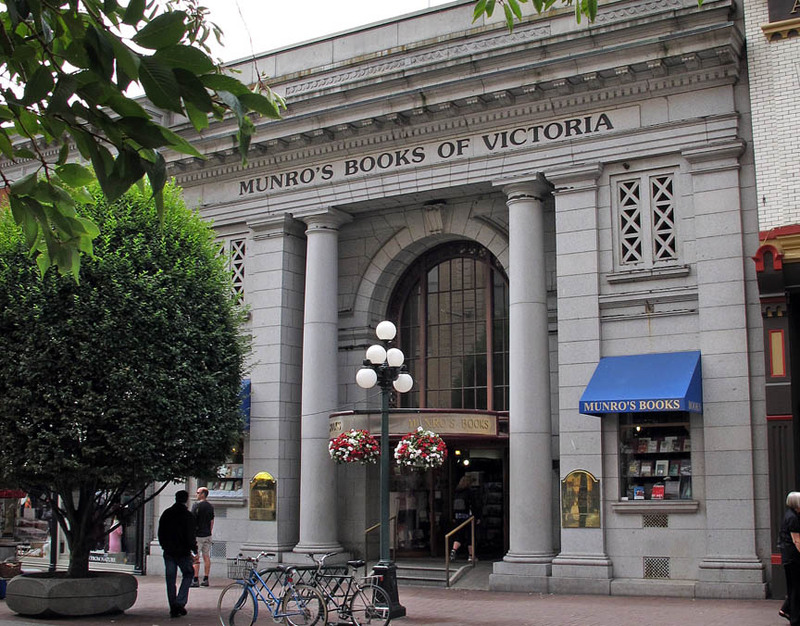 Also high on my Victoria list are the two M’s: Murchies and Munro’s, cheek by jowl on Government Street. Murchies, home of fabulous tea, and Munro’s, wonderful bookstore, are places I can spend waaaaaayyy too much time and money. They are staffed with kind and knowledgeable salespeople who have mastered the delicate art of being helpful without being oppressive. And I love walking into Munro’s. It’s like a Victorian bank on the outside and a lovely library inside. Plus, if you give them money, they let you take the books home forever. Another one of my favourite things is to oogle the Legislative Assembly building (aka Parliament) because it’s so much more stately than anything in the states. It reeks of England—in fact, it is a replica of the English Parliament building. And every night at dusk (which in the summer is about 9:30 p.m.), thousands of bulbs wink on and light up the place. But you and I (as rowdy Americans even) can make our way to the basement to the Legislative Dining Room and have breakfast, lunch or tea in wood-paneled splendour, with the faces of long-dead members of Parliament looking down on you from period photographs. Love the shrimp sandwich, by the way. 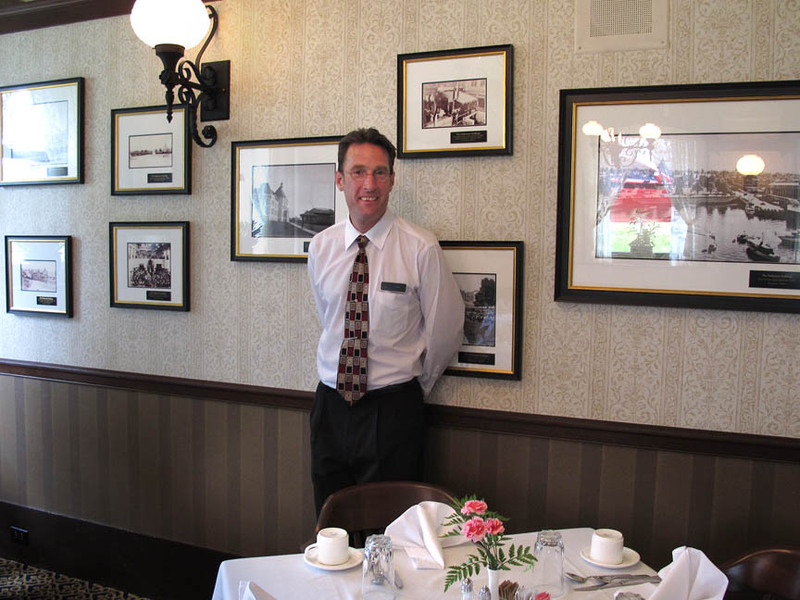 We also love the dining room because of Mur Meadows, waiter and playwright, a charming man who regales diners (only if they ask, of course) with tales of his current projects. His play, “The Return of Love,” is not only available online but also available free to theater groups that wish to perform it. I’ve already written about my favourite tea room, the James Bay, but I’ll also give a little shout-out to our favourite fish and chips place, Barb’s, on fisherman’s wharf. 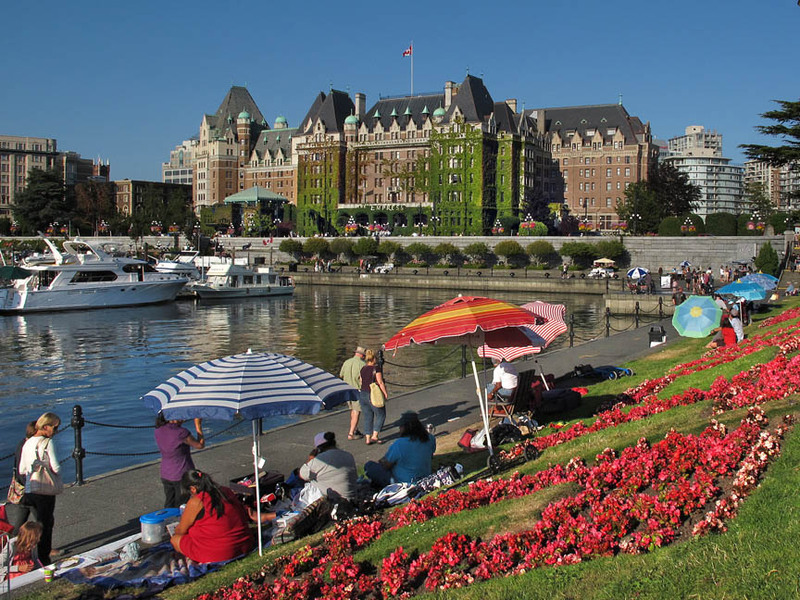 It’s an easy walk from the Inner Harbour, or a quick ride in a water taxi. You eat outdoors, under a tent, right on the dock, and we are quite fond of the halibut and chips combo. It is not cheap, greasy fish and chips, but high-quality stuff. If you’ve been to Victoria, I imagine you have your favourite spots, too. What are some of yours? Toss a comment this way, and I’ll add them to my list, too! With all these wonderful Canada posts, you’ve nearly got yourself a travel guide! Nice!!!! !